No one wants a sick pet. Unfortunately there are times when our pets do get sick, and we need to find the best products to help them get well. My little Gizmo years ago had kidney stones, and needed a bland diet. I didn't know what to give him, so I had to spend a lot of time researching to make sure what I was feeding him was not only bland, but nutritious. I spent a lot of time finding the right mix, that could have been spent with Gizmo. Under the Weather makes this easier by offering bland diet foods that are freeze dried and ready to use when you are. You just add water, and serve. The products are made to be gentle on the digestive tract, along with being 100& human grade white meat chicken, or bison. Quick and convenient freeze dried formula of 100% human-grade white meat chicken, white rice and pumpkin powder. For use when your veterinarian recommends a bland diet to soothe your dog’s digestive tract during times of upset, such as vomiting or diarrhea. This diet is only to be used until healthy digestion is restored and the stool is normal for 2-3 days. All ingredients are raised or grown in the U.S.A. and meet the finest quality standards. Pumpkin added for additional digestiive benefits. Gluten free and made with no artificial flavors. Just the best for your dog! 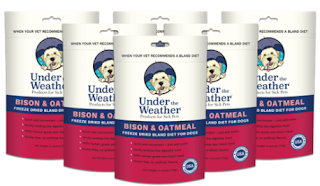 I definitely recommend checking out Under the Weather products if you have a sick pet, or just grab a bag to keep on hand, just in case!